This page is a new addition to my website as of October 2003. Up till now I have not thought about adding a Silver Wing review, but just recently two things made me think about it. First I got an email from someone asking why I didn't have any stories about my Silver Wing. Then yesterday I saw my old Silver Wing and talked to it's new owner of 2 months. I have not seen it for 11 years since I let it go in 1992. So I decided it was time for a new web page. The old Silver Wing was still on the road after 20 years, looking fit for another 10 at least. The only confusing thing was that the odometer showed only 60,000 km, while I was sure it was reading over 75,000 when I sold it. That motorcycle is another argument for running the BMW for 20 more years. I bought my Silver Wing in 1983 to replace the Yamaha 250. It was a new leftover 1982 GL500 model, silver gray color, and cost about $1500. I had the standard model (no fairing or bags), but it came with a small trunk that could be attached in place of the passenger seat. Click on the thumbnail to the left to see me back in 1983 adjusting the rear air suspension on my new Honda GL500. Honda was pouring on the technology. 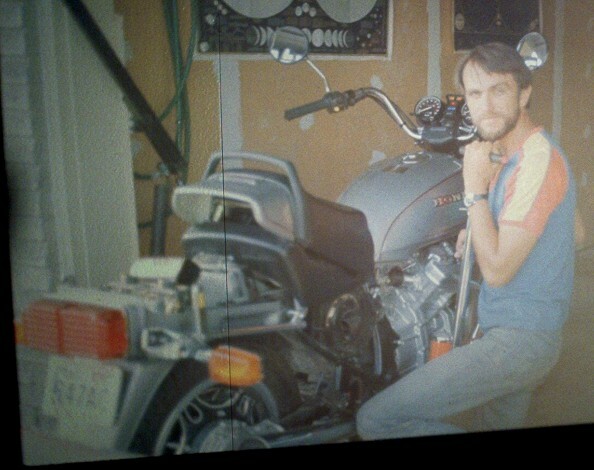 Up to 1983, I had only owned a 1970 Honda 175 and a 1972 Yamaha 250. Look at this long list of all the technological firsts introduced to me by by the 1982 Silver Wing! Most of the firsts above I have on my current bike, the 1992 BMW K1100LT. Others, marked with a * might be a once only affair, or were surpassed in some other way, like the CV carbs that were replaced by fuel injection on the BMW. Many other advances in the list are still common today like the four valves per cylinder. What did I like best about the GL500? I was very impressed with the smooth rear suspension. It gave the impression of floating on air. I don't think I have ever ridden a bike that glided over bumps as comfortably, including my BMW. It was the combination of Pro-Link suspension and air adjustable single shock. Unfortunately, it did require some maintenance, and I knew someone with one of these bikes where the Pro-Link seized up giving his bike a rigid rear end. Mine never seized but it did need disassembling once to lubricate the joints which had started creaking. The Pro-Link suspension did not interfere in any way with the cornering ability of the GL500. That was another surprise, a heavy, softly sprung bike that cornered as well as the DS7, and better than the Honda 175. Today I would say it is about equal to the BMW, but better than the CBX I had. Almost everything else about the Silver Wing was hardly worth noting. What I mean is that it was as reliable as I expected a Honda would be. It worked the way I thought it should, meaning no surprises, no quirks. I liked a lot of the stuff that was new to me, like shaft drive, tubeless tires, and water cooling. But what is there to say about them? Of course you don't have to lube a shaft drive every 300 miles, and it doesn't fling lube all over the back of the bike. A big gas tank goes further between gas stops. Electronic ignition does not need regular timing tune ups. An oil filter makes the oil last longer. These things are just facts and nobody needs to hear my opinion on them. The GL500 had more power than the DS7 250, but it did weigh more. Overall the engine was better in other ways, because it produced power over a much broader rev range, and it could go up long steep grades without overheating. If I needed more power for passing, I could shift down a couple of gears and it would usually be enough. It was powerful enough to smoke a Harley Davidson, but compared in hindsight to my CBX or BMW, it was not that impressive. The CBX felt like being fired out of a cannon. The GL500 by comparison just goes. I don't actually need the power of the BMW most of the time, because I rarely even shift it out of top gear when passing. With the GL500 it was kind of dangerous to not downshift at least while passing, even solo. The first thing I did with the Silver Wing was to add a windshield. This was a handlebar mounted thing, which I never did like very much because of the buffeting, and I cut it lower and lower until it almost disappeared. Finally I decided to order the Interstate fairing through the Honda dealer. I think it cost about $800. I got it with the lowers to keep my feet warm and dry in bad weather. The fairing had no mirrors, so I kept the handlebar mirrors. With this setup, I could usually get out for a ride at least once a month, even in winter. One year I had the honor of getting the first motorcycle speeding ticket of the year for the province of Ontario. January 1st, 9 AM. 125 in a 100 kph zone. Next I bought some used Krauser bags for it. It started to look a bit like a BMW. It had a lot of features that made it like an inexpensive BMW. It was about the same weight and power (BMW's at the time were air cooled twins), and had shaft drive. I also put on a passenger back rest/luggage rack. Another advantage of the CBX, or disadvantage of the Silver Wing, as I discovered later was that the Silver Wing had no owners club. And even if it had one, I might not fit in. The CBX had a great owners club and it was chock full of wild and exciting riders. Wheelies were common on club rides (not by me). Enough said about that, but you get the idea that Silver Wings did not inspire many great owners clubs. But this had nothing to do with function, just what types of people normally buy these things. During the years I had it, I performed some other upgrades to the Silver Wing. I changed the steering head bearing to tapered roller from ball bearings. I replaced the halogen light with a regular filament type because the halogen light had too sharp a cutoff. I could not read overhead freeway signs, the cut off was so pronounced. Anything more than three feet off the road surface was dark. In later years the halogen lights must have improved, because my BMW has one that is fine. But my '82 CBX also had the same problem. I kept both the Silver Wing and the CBX for several more years, but the CBX proved to be quite reliable and fun, and was the bike I rode most of the time. In 1992 I replaced both bikes with the BMW K1100LT which was kind of the best of both bikes combined with a price tag no more than four times the combined cost of the two Hondas. The Silver Wing and I parted company in 1992, and I did not see it again until the morning of October 11, 2003, at Tim Horton's in Arthur. The aluminum finish on the engine was a bit more corroded. It had new handgrips and new fairing mounted mirrors. The front brake lever had an interesting curl to it. And it apparently had 10,000 km less than last time I saw it. Otherwise it looked in great shape and I was happy to know it was still on the road.